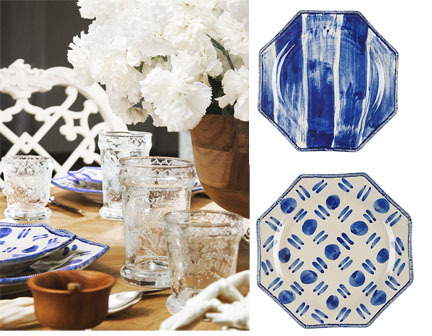 If so, your right on trend with the resurgence of this rich, deeply moody “Indigo Blue. Its becoming a favorite with designers from fashion to home decor. The newest twist with this hue are the textures used to portray this beautiful color. I personally, as a side line, predict brush stroke techniques coming back into play with our lives but hey…lets get back to our new moody blue: Indigo! You will find this blue in various styles and techniques. Paris street fashions reflect a strong sense of blue returning to women and men’s wardrobes. This new blue comes with added textural edge style which might include tie dye, painterly brush strokes, ombre affects or batik treatments making this INDIGO blue updated and perfect for today’s fashions or interiors. I’m getting moody blue just thinking about this color. Aren’t you? Bejeweling or bedazzling designer glass beaded wallpaper has been the unexpected it, a quiet trend for quite some time now. Maya Romanoff’s Bedazzled wall covering has been around for a while too, but is still as fresh as ever. Available in an assortment of colors, this wall adornment is as big of a statement as a piece of art. 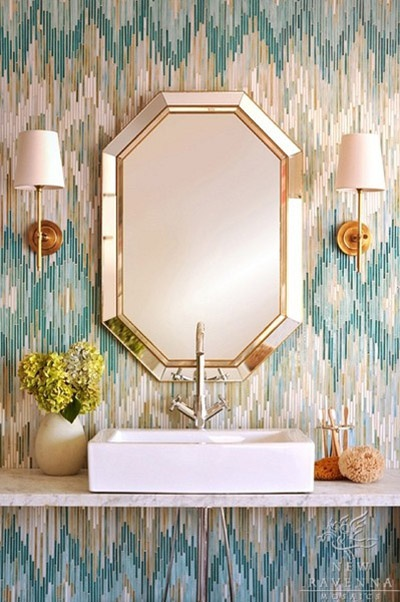 This colorful glass beaded wallpaper is fabulous when used for fireplaces, powder rooms and for anywhere else you want to make a statement. The subtle shine is unique in the fact that it can be used commercially or for residential use. No matter when or where you use it, Be-dazzled is always going to create a winning look. This is luxury at its best. Shine on! 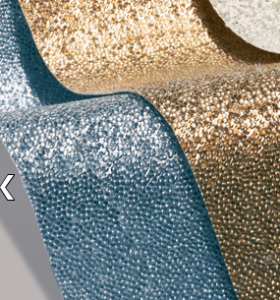 Photos courtesy of Maya Romanoff for glass beaded wallcovering product images and .mayaromanoff.com for the wall images. Emerald green may be the color of the year, but it’s teal that I’m trending toward this season. Not only popular in fashion but also in home design. Teal is one of those unique colors that looks equally stunning mixed with a warm or cool palette; it is as versatile as it is bold. As always, I love it big and bright and envision a full wall in a rich teal-ectable hue in my near future. If subtlety is your m.o. introduce by the cup instead of the gallon. Lamps, bedding, trim; all good places to start! Greece itself may be struggling, but its style influence certainly hasn’t diminished. The Greek key motif is trending throughout the design world…finding its place in a number of rooms throughout the home. The best spot to sport your Greek love? The bedroom, I think. Loving the bold look of the red design adorning crisp white bedding. 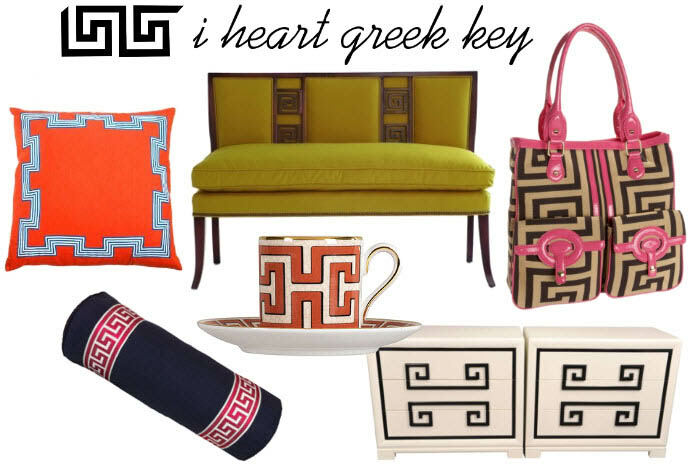 Better yet, give yourself a new DIY project and create your own Greek key look. A gilded Greek key dresser, perhaps? I’m Jaima, a designer who loves animals…especially birds and dogs! 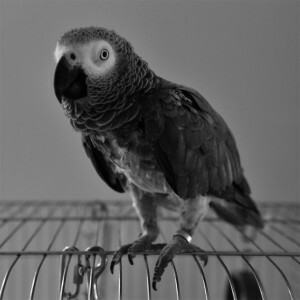 I own Lily, an African Gray who I inherited from my late mother in law, Alice. She loved Lily. At first, I was terrified! Now, I’m not afraid of any small or big bird. Remember, you can always overcome your fears when love is involved. I am learning that birds are very social. Yes…SOCIAL but they are also coming into trend in home and fashion. As I say goodnight to my week of floral review, I leave you with a comfy place to curl up and declare your list of resolutions. It’s the yin and yang of design here. The masculine nature of club chair styling with a confidently feminine twist. 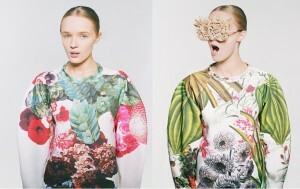 The classic floral mixed up with a bold scale and color scheme. A floral-inspired pillow used to somehow tone down the impact of an already powerful floral look. Which flower bomb has you wanting to ring in this new years style? The bold digital prints I have favored in recent posts regarding the fashion and home style genres alike are apt to include some great floral variations. These Pinterest finds are significant in their synchronization of past, present and future; the decidedly retro incarnation of balloon sleeves and a nipped waist, contemporary fabric with a classic floral meets digital print in a very McQueen-esque futurism. These are some florals to fawn over through the ages! Buns have been around in their various iterations for centuries, they have even earned title mention on the small screen with this summer’s short-lived comedy-drama Bunheads. Past generations have been well worn and loved by ballerinas and stylish conservatives alike. With street style veering more and more to the casual, so has our hair. This refinement meets haphazard mash up has introduced to the messy top-knot, my personal favorite version of this height contributing style. A great do to offset a super sleek ensemble or compliment that perfectly planned grungy look. This do’s a do!! Reminiscent of Missoni’s, well, almost everything, the flame stitch is once again having a moment. 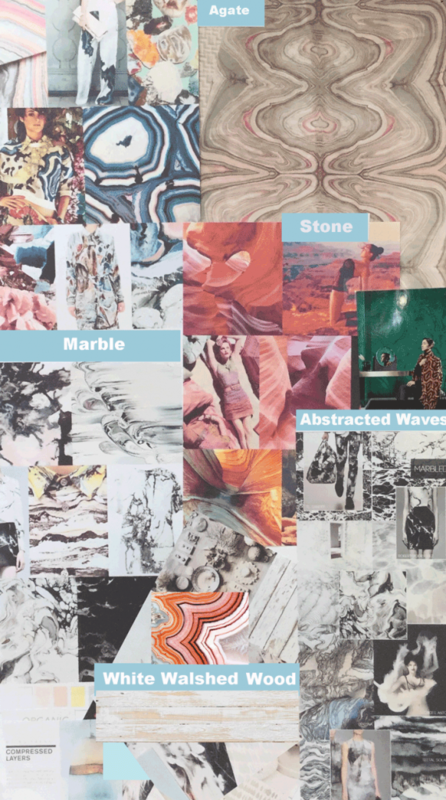 An endless array of color combinations and various forms of geometric interpretations make for an appealing focal point. As a wallpaper (like the one pictured below), or reinvented as a rug, or even just pieced in with a great decorative tray or throw, the flame stitch pattern is both visually stimulating and practical. It has been around for a thousand years and is as relevant and usable as ever. 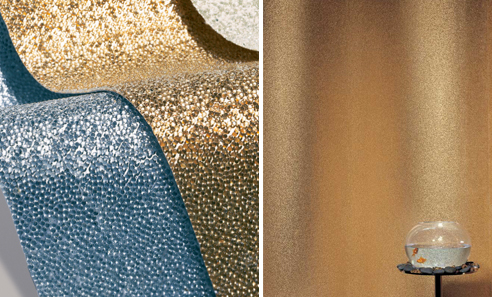 Whether splurging for Missoni or opting for a more affordable option, why not use a new flame stitch element as the color inspiration for a room overhaul? !